Sunspel underwear was made in Nottingham from 1860 onwards and it is still in production. The trade name, Sunspel, was used from 1936, and the factory was situated in Long Eaton, Nottinghamshire, for a considerable period of time. Breedon Press must have been a local printer, who produced a high quality imprint, but it is difficult to get any information about the firm. 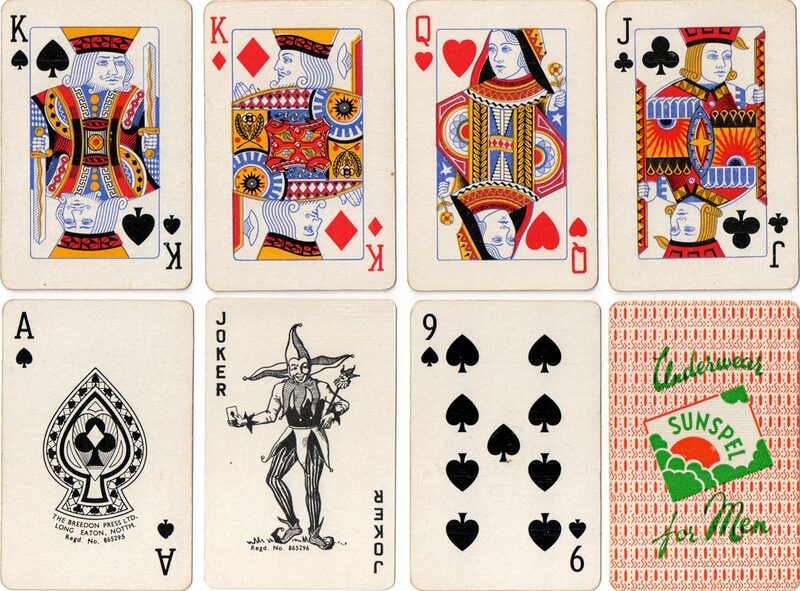 The design of the playing cards is idiosyncratic and not based on anyone else's. Above: playing cards advertising Sunspel underwear printed by the Breedon Press Ltd, Nottingham, c.1958. 52 cards + Joker. 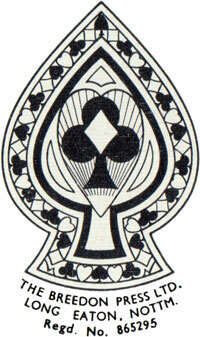 The registration dates of the Ace of Spades & joker are believed to show that the pack dates from 1958.